There are two ways to insert a new row in RadGridView — by pressing the Insert key or by calling the BeginInsert() method. 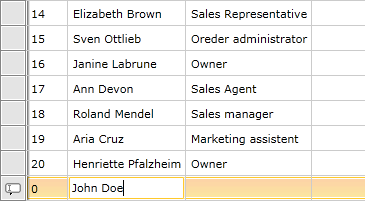 When a user adds a new item, an empty row is created in which the user can input data. If the IsReadOnly property of RadGridView is set to True or the CanUserInsertRows property is set to False, no row is added. The underlying object should expose a default constructor for an empty row to be added. The next step in implementing the adding functionality is to attach event handlers to the AddingNewDataItem and the RowEditEnded events. 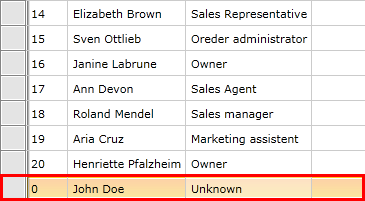 The AddingNewDataItem event is raised before a new row is added to RadGridView. A typical use case would be when you have to set initial values for an initialized object. You can do this by passing an object to the GridViewAddingNewEventArgs's NewObject property. Via the OwnerGridViewItemsControl property of the GridViewAddingNewEventArgs class you can access the GridViewItemsControl for the RadGridView that raised the event. When the user presses the Enter key. When the CommitEdit() method is called. When another row is selected. When the insert operation is cancelled by pressing the Escape key or calling the CancelEdit() method. You can access EditAction (Commit or Cancel) and GridViewEditOperationType (Insert or Edit) using GridViewRowEditEndedEventArgs of the RowEditEnded event. It also allows you to access the new data via the NewData property. //Add the new entry to the data base. 'Add the new entry to the data base. When the new item is committed, it is added to RadGridView's Items collection.